What Are Lumon Patio Covers? A constant problem we've detected and determined ourselves to fix is the limited seasonal use of your balcony space. Often, as soon as the weather turns windy, rainy or cold, balconies become unusable. Even when the weather is pleasant, balconies still need to be cleared of leaves and bird droppings, and outdoor furniture must be dried. Lumon’s retractable balcony glass solves these problems by providing homeowners many advantages with the added flexibility of being able to open and close the glass balcony panels as desired. What is frameless retractable glass? Unlike typical frameless glass sliding doors, our frameless retractable balcony glass opens fully and folds tidily against an interior wall. Because they fold to the inside, our glass panes are easy to use and maintain. They can also be secured to prevent them from moving with the wind. While glass may suggest something delicate, our balcony glass is designed and tested to stand up to strong winds and harsh conditions—while still looking sleek and elegant. Although we can customize our Lumon balcony glass system for almost any use, the most common applications are railing-to-roof balcony glass and floor-to-roof balcony glass. Railing-to-roof balcony glass is designed to work with existing balcony rails, extending from the top of the railing to the ceiling. Alternatively, we can replace your existing balcony railing with a Lumon glass balcony railing, available with or without vertical posts. Lumon railings and Lumon balcony glass look phenomenal together and create little visual obstruction. Floor-to-roof balcony glass sits inside the balcony railing, providing another simple and elegant solution. Regardless of which option you choose, you’ll love the refined and minimalist look of our balcony glass. You’ll be amazed at how light it feels and how easily it opens and closes—all while having the strength to withstand winds of 300 km an hour! Lumon balcony glass is CCMC approved (Canadian Construction Materials Centre) and meets zoning requirements for condo balconies. Our team will also work with you to get approvals from your strata council or condo board. Our frameless retractable balcony glass is not considered a permanent enclosure and, therefore, does not count towards total square footage. I am so pleased to have control of the wether on my balcony. The tempered glass has reduced the highway noise and I can now leave my balcony sliding doors open. No more wind, dust, rain, snow or grime. I would definitely recommend the Lumon window enclosures for anyone who wants to make better use of their outdoor space. 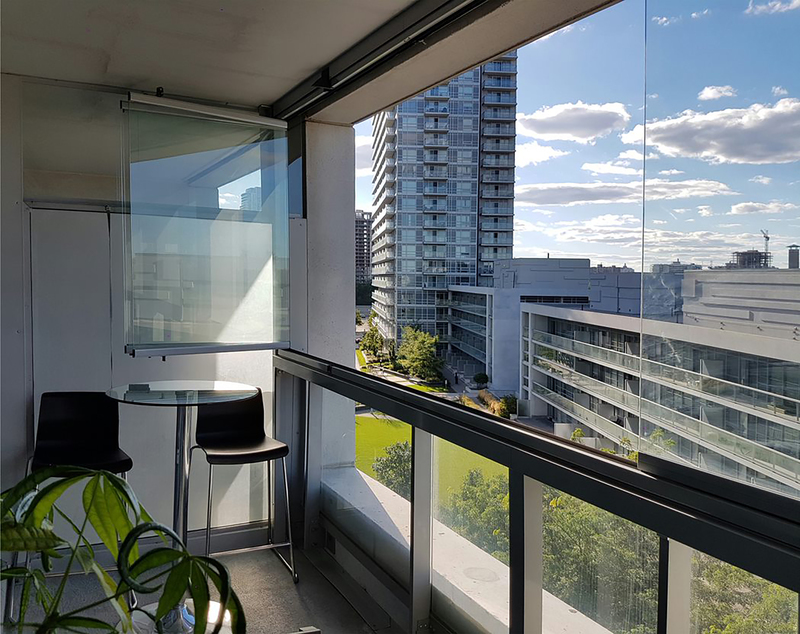 Enclosing your balcony is an attractive option for homeowners because of the provided safety, less need for repairs, aesthetics and design, energy savings and more. The truth is, we can't think of reasons not to enclose. Learn about balcony enclosures and all the possibilites it will provide for you. How to easily purchase balcony glass? Dedicated to building better homes, our desire is to beautify your outdoors so that we can improve the lives of people, the quality of their homes and offer an enhanced lifestyle at an affordable cost. Our consultation is offered for free to provide you with an accurate estimate that will fit your budget. We recommend to book an appointment with the advisor in your area to get the best solution. Contact us, we are here for you. 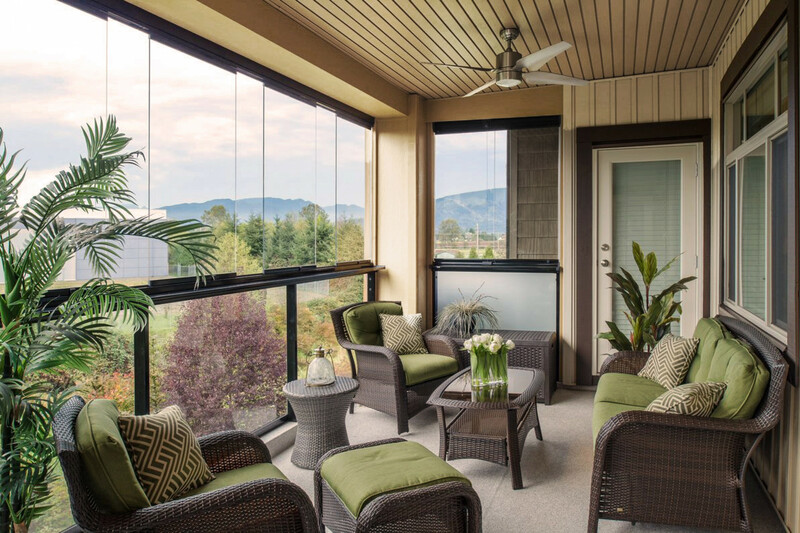 Get inspired with our balcony glass photo gallery. Gather ideas on how we can transform your outdoor space into the place of your dreams. Visit our gallery of images and discover everything you could create on your balcony. Imagine, dream, design and believe that we make it happen.